I love bright colors – the way they can take an ordinary floral arrangement and make it pop. One of the best colors to add that special touch is orange. This warm, vibrant shade gives a fun yet cozy vibe to any wedding. Often people can be intimidated by this alternative color; however, orange can transform your event depending on the colors you pair it with. By combining orange with warm, earthy tones such as brown and gold you can achieve a rustic, laid back feel. Often used during the fall season. However, a more modern color scheme can be achieved by pairing orange with blue, purple, or green, which leads to a fun, exciting ambiance. 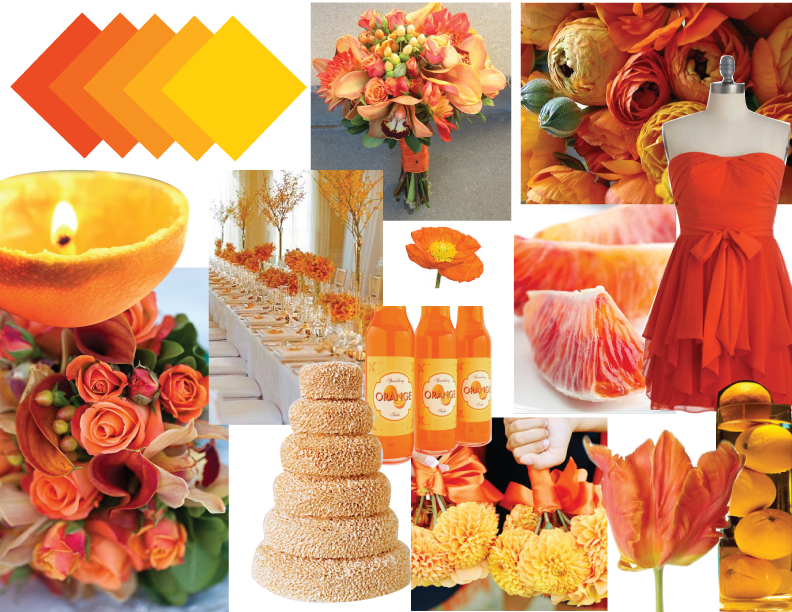 Whatever direction you choose to go with there are endless orange options for your wedding or event. From light apricot to bright tangerine flower choices abound. Some of my favorite orange flowers are dahlias, tulips, roses, orchids, and calla lilies. In centerpieces I even have utilized orange fruit either whole or sliced to add a unique touch. All links for photos can be found here.